Sky Zone Lexington is a great trampoline park in Lexington and is an awesome way to get fit and have fun! Recently my kids went for our first trip. Here’s our review and some info to help you plan your trip. 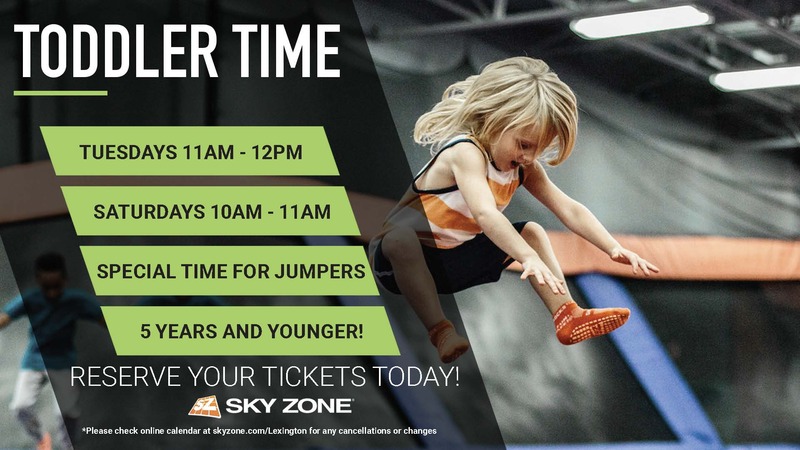 Be watching their Facebook page and website for updates on special events, holiday and schools out hours, as well as special Toddler jump times! When you enter you’ll complete an online waiver for each participant. It’s a simple process and you won’t need to complete it each time you go just on your first visit. Waivers are good for one park only (if you’ve flown somewhere else you’ll need a new waiver) and are good for around one year. You can be extra sure you’re good to go by completing it ahead of time each time just to be sure if you’d like. You can even sign it from home online and buy your tickets ahead of time to save you time. They have online reservations so you can guarantee your bounce time. Walk-ins are welcome anytime, but we do have a capacity limit! Pre-purchased tickets for individuals and smaller groups are recommended in order to guarantee (when available) your jump time, and can be purchased by clicking here; reservation fees apply. For information on large group reservations, Click here. You head to the counter to pay and get your special Sky Zone gripper socks. Socks are free and you get $1 off if you bring them back on your future visits. There are free lockers available for you to store your things in while you jump. After you check in you get a sticker with a printed time on it. This is your ‘flying’ time. You then need to check in with the attendants in the main jump area for a rules session. They will review the rules with you so you know what the expectations are in each area. Once you hear the rules you get a dot added to your sticker and you’re ready to bounce. Sky Zone is divided into many separate areas which is great! You’re not all in one big massive area and special things are offered in each area. After you get your sticker you can stay in that area and bounce on one of the many trampolines connected there and up the wall. There were multiple staff there when we visited and they were great about being on top of keeping kids safe. There is an enclosed dodge ball zone where a staffer monitors the game at all times. People are divided into two groups then play begins. Once you’re out you move to the side until this match is over and a new one starts right back up. There are two dodge ball areas – one for older kids (teens) and one for younger kids. I loved that my second grader wasn’t playing against kids twice his age. There are three different basketball hoops each with their own ‘lane’ and each is a different height. There is a Sky Zone staffer at the hoops that will help pass the ball to the next person in line. It’s super organized and helped prevent anyone from getting hurt or bonked with a loose basketball. There is a giant foam block pit with different lanes for kids to jump from. There is a Sky Zone attendant at the lanes that helps kids take turns so they aren’t all jumping into the pit at the same time. Each lane has a color assigned to it (red, blue, red, blue). The attendant will hold up a red block for the kids in the red lane to jump then a blue block when it’s their turn. More organization and this mom loved it!! I knew my kids were less likely to get bonked by a big kid, hurt jumping, and were having more fun! There are tables, benches, and bleachers throughout the facility so you can take a seat while your kids play. They have a lounge with sofas and TVs upstairs overlooking the jump areas. My kids even thought it was fun to go up there and wave to their friends. When your time is up there is a friendly announcement that you can hear clearly that will tell which flying time is over. There is also a great check in area for parties. If you have your party at Sky Zone your guests will get to check in at the party counter – not the regular counter. You’ll have your own party room and help with your party. They offer fitness classes as well so it’s not just for kids at Sky Zone! The facility was clean, organized, well supervised, and we had a ton of fun! They do have a snack bar with treats but also healthy options like animal crackers, granola bars, fig newtons, and fruit for just $1. Waivers are required for all jumpers. Anyone under 18 must have a waiver filled out by their parent or legal guardian. Fill out waiver here before arriving Previous jumps to not guarantee waiver is on file. Waivers expire after one year. Follow their Facebook page for all the latest Sky Zone news!! All pricing includes access to SkySlam and Foam Zone! SkySocks are $2 and are required but they are yours to keep. Bring your SkySocks back and you won’t have to purchase them for $2 next time. Sky Zone invited us as guests for a visit but all information in the review is my own. The Jumparound package is our most popular birthday party package and includes everything you need to throw the best party ever! Packages include 10 jumpers. Additional jumpers can be added for $17 Tues-Fri/ $21 Sat-Sun. The HighFlyer party is for those that want more time to play, compete, conquer and FLY! This package includes 90 minutes of jump time to enjoy everything that Sky Zone has to offer. Packages include 10 jumpers. Additional jumpers can be added for $19 Tues-Fri/ $23 Sat-Sun. My son loves Sky Zone & can’t wait to go back! This sounds exciting. You are a great writer you made it sound amazing. I’m ready to go!!! You’ll need to log in or use your email to start. Then there are a few things to do to be entered – like them on Facebook, Twitter, tweet. Good luck!